Fumiko Nashiro, photo by Kyodo News. Click image to enlarge. 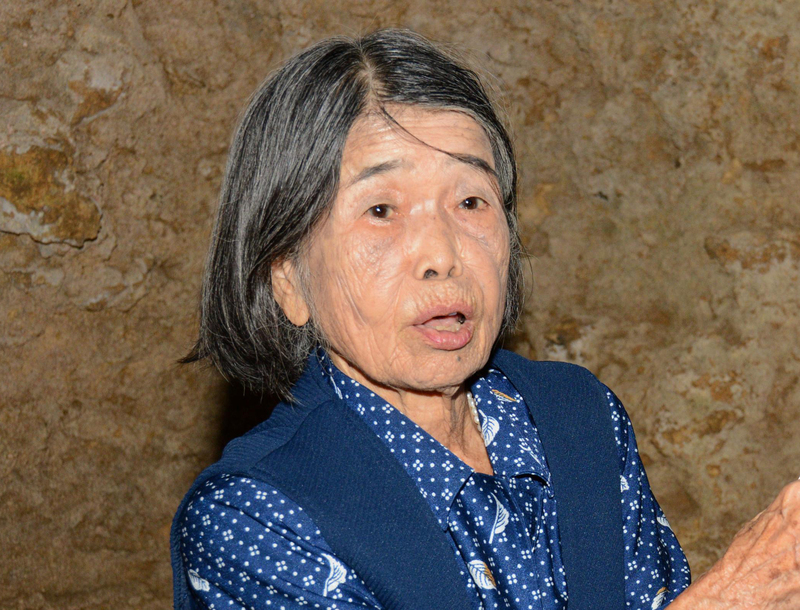 In 1945, the last year of the Pacific War, Nashiro was 18 and a fourth-year student at Sekitoku Women’s High School in Okinawa. When 25 fourth-year students were formed into the Fuji Gakutotai nursing unit for the Imperial Japanese Army in March 1945, she willingly joined “for the sake of our country,” she recalls. Some 500 high school girls in Okinawa were mobilized in nine nursing units. Many of those students were killed in the fighting between U.S. forces and the Japanese army. And there were also many who committed suicide — made to believe they would be raped if captured by American soldiers. Amid all-out attacks by U.S. forces, the Japanese army issued orders that Fuji Gakutotai and the other nursing units be dissolved in the closing days of the Battle of Okinawa, which raged from March through June 1945. The Fuji unit leader kept members in the bunker until the attack subsided before telling them to disband. The leader, an army physician, turned down the unit members’ requests for hand grenades to commit suicide. After confirming that the members had safely left the bunker, he killed himself with cyanide. Nashiro lost her parents, grandfather, an older sister and a younger sister in the Battle of Okinawa. The younger sister joined a nursing unit called Himeyuri Gakutotai, most of whose 222 members died either during attacks or in mass suicides. This entry was posted in Battle of Okinawa, Culture, History, International, World War II. Bookmark the permalink.